This was a crucial day and on the first big valley crossing I said “I was thinking that this could be one of the most important glides of the whole race”, but immediately after saying it I thought, well, hang on, there is going to be maybe a dozen make or break moments in the race. Looking back there are about half a dozen critical moments that I can think of just for this day (! ): day three, where I rounded the Triglav turn point. I glided into the head of the valley whereas Gavin went for the spur close to the main valley. While there wasn’t any steep sunny faces on my route, with some extra height I had the option of gliding out towards Gavin. In any case I felt my option was good because it was all in sun during my glide but fell into shadow just as I arrived. (As I understand it) katabatic drainage flows on the recently shaded surface lifted up a thermal over the valley, and sometimes even mountain flying is more than just looking at the thermal skyways and flying a pre-programmed route. In any case in that place I didn’t have a lot of wiggle room between shallow, shady, and mostly forested slopes and the cloud, so if there’s a climb in the valley I’ll take it. Even then I didn’t have enough height to clear the next pass and had to land up and walk. In the end this more likely than not saved me as I needed every last metre of height (including those gained when walking up to the clearing to launch) to glide past a forested ridge and onto the next sunny faces where I found a thermal. Relatively early in the day and with lots of cloud development early, timing was very important. Earlier in the day I’d scratched around for maybe fifteen minutes before top landing while I still had a chance (below was forest). About fifteen minutes later I took off straight into a strong climb from the same place that got me to cloud base. Inspecting the track logs you can see my route was rather unique, and probably not the best – I followed the more popular route more closely on the return trip. I very nearly came undone west of the Santuario, where there was a disturbing lack of relaunching options. In shade I was just holding on waiting for sunshine. Less than a kilometre to the north four pilots had climbed out from low on the spur (presumably soaring up on the valley wind), but I didn’t know about this and didn’t really have the height to explore. I was painfully aware of the need to hurry along to Triglav, as the southerly valley flow was strengthening. It was difficult to be patient with other pilots flying fast in the other direction. It was the technical type of flying that pilots call “hard work”, but really, pulling on a few strings and leaning from side to side beats carrying a pack any day. Just six kilometres to the Triglav turnpoint – but not an easy six km! So we had the Gail crossing, the forced landing saving me, some dire moments low below the Santuario, and on the way to Triglav a desperate push in the lee to pop through a forested col, and now the next obstacle was getting through the pass into Slovenia. It took me two goes but I managed – just. Minutes later I was thermalling up directly over the turn point and heading back the way I’d come. 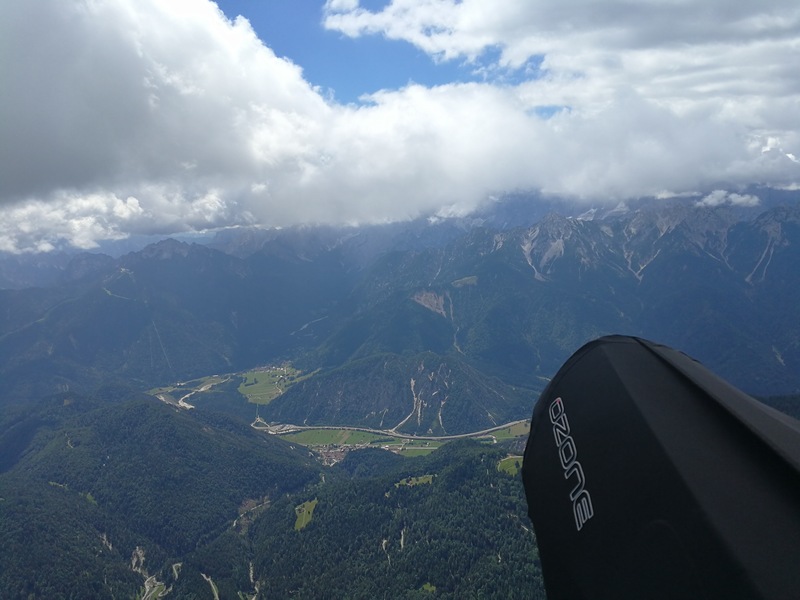 As I thermalled up before crossing back towards Santuario I watched another glider try to repeat my recent move through the Slovenia pass. 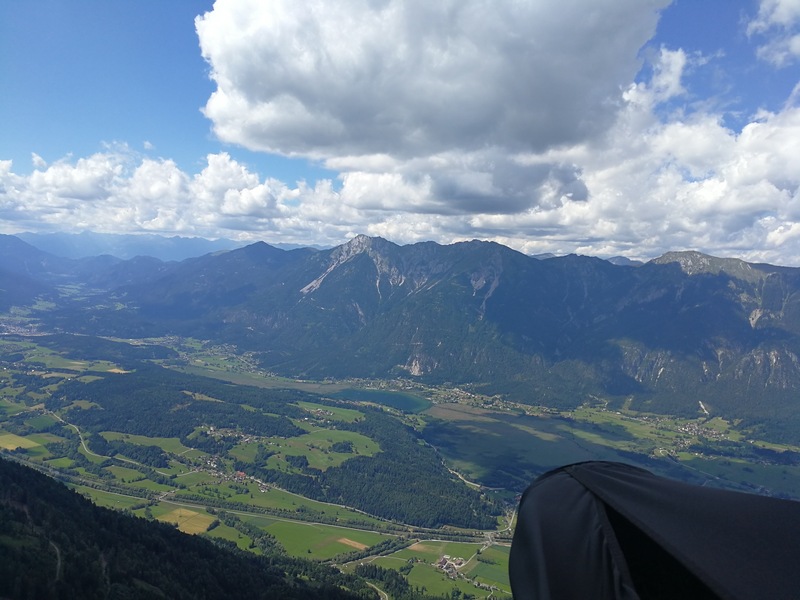 I later discovered it was our mate Krischa (SUI2) who landed just short, and had to hike down 400m elevation then back up windy roads due to launching within this Slovenian national park only being allowed at the official take off. I got myself a bit stuck a few times on the way back to the Gail, flying conservatively and figuring out a strategy for the route ahead (involving some whatsapp conversations with Ben). As I crossed the Gail though Steve Bramfitt, who had loaned me the gear the previous week in Interlaken, came to join me. We flew together for a while before I lost him in the shade. I managed to get out and regain some height and ended the day back on the main divide, ready for an early start high in the mountains. I even got some phone reception to reassure my worried mother! 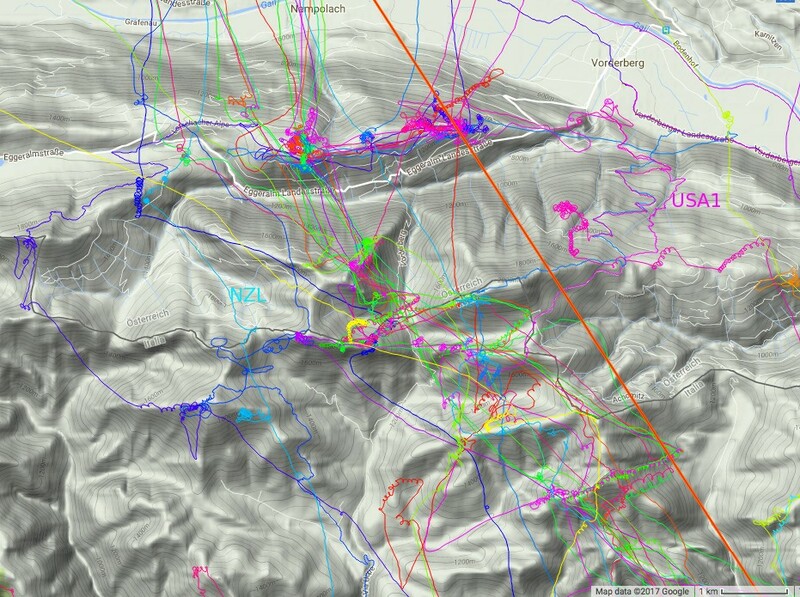 Note: these tracks are thanks to paragliding legend Tom Payne and are available on dropbox, you can drag and drop the .igc files onto xcplanner or the kml files onto Google Earth. Thinking about landing here but hoping I can get up. So yeah I had to land as I was sinking out but took off from virtually the same place, and a cranking climb. At the last minute (or last second) I decided I didn’t have enough height to fly through this pass. These cows probably know that. Just in case you’re wondering, this was a terrible landing. I don’t normally land like this. And yes I did clip that tree. “Hmm, a bit of a risk but there’s relaunches there, and hopefully there’s landings – well, hopefully I don’t need any of that! “Having trouble figuring out what’s going on here. Getting a bit low here. Not many relaunching options either. As difficult as the flying was, it was still much better than walking. This was a make or break day. “Now I’m just trying to get something out of the lee here. I can see another glider getting drilled over there. Getting cleaned up here! Oh my God, get me over! I was getting totally smashed in that valley behind. Well now I’m 3 and a half kilometers away, I’d really like to get this turn point done and dusted. It’s just in there. I’ve just seen an armada of guys coming back so I can have a look at how they’re going.. they’re climbing out. Getting in is an absolute nightmare. So many different winds here, and I’m usually in the lee. It would be good to tick this one off, as I’ve said a few times today. It’s already 2pm. Well, I’m in Slovenia. No landings allowed. It’s absolutely terrible in there. Not easy, glad I managed.” [Krisha SUI2 approaching a landing at the col]. “Yeah for sure, let’s get moving. I’ve been flying really slow today, had a few tricky parts. There’s Steve… some decent lift around here. 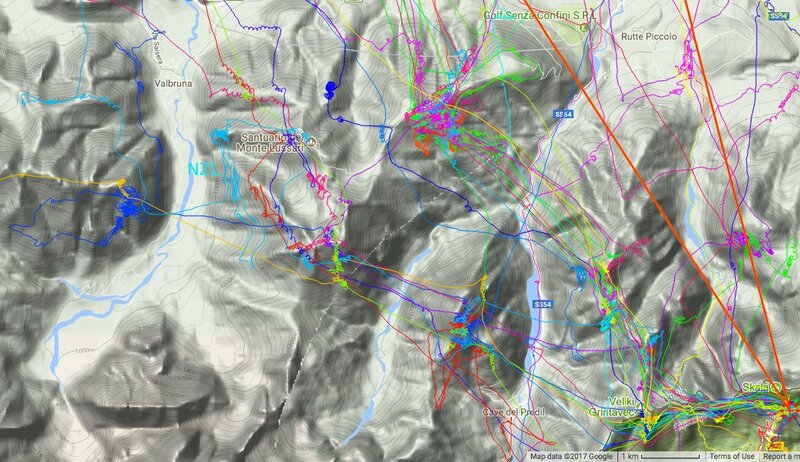 Good climb here – but where to go next? Steve’s still with me. That’s Triglav, gee it was a mission getting there. Oh, Steve’s up nice and high. Hope I can get some lift out of there. Well this shady experiment is over. Let’s go get smashed. I’m up again. Good lift, as you’d expect with the sun beating down and these huge clouds. As you can see, not a huge amount of wiggle room. That’s the main divide ahead of me. Up there I got to 2500m. Ben said some of the others had gotten up to 3500m, I don’t know how they could have done that without going into cloud. Anyway, 6:25pm. Wow, maybe it will work. It’ll get me a bit closer anyway. So 2000m, this is the height that I started soaring here. I got up a few hundred metres then lost it. I haven’t decided for sure, but I’d probably like to get to this pass. Hey man, I love how you transcript your Videos. That makes them a lot more comprehensible and usefull!